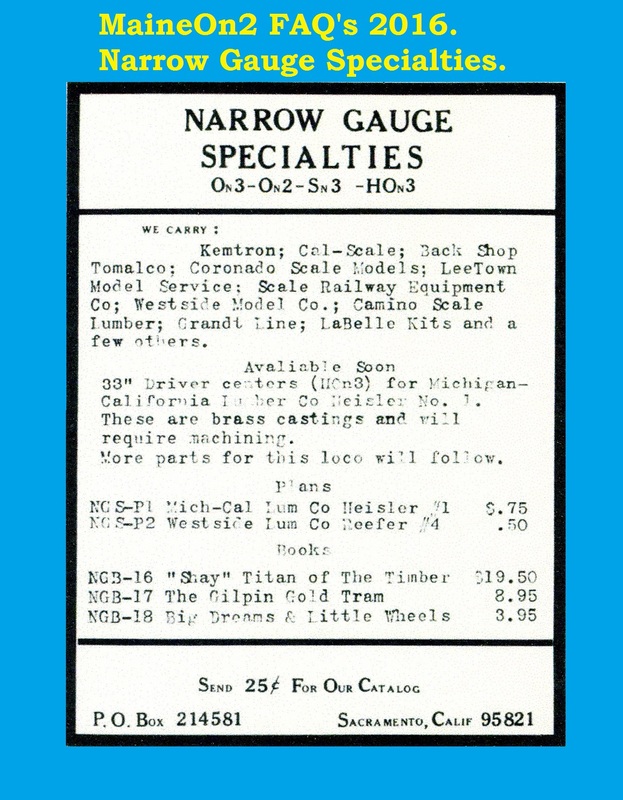 Narrow Gauge Specialties, an early supplier, 1971 – 1974? My brother Ric and I first started modelling the Maine two footers in 1961 after reading Allan Hanson’s article “The Sandy River Goes HOn2” in the April 1961 issue of Railroad Model Craftsman. We began modelling in HOn2. In 1970 we switched to On2 so we could get more detail in our models. 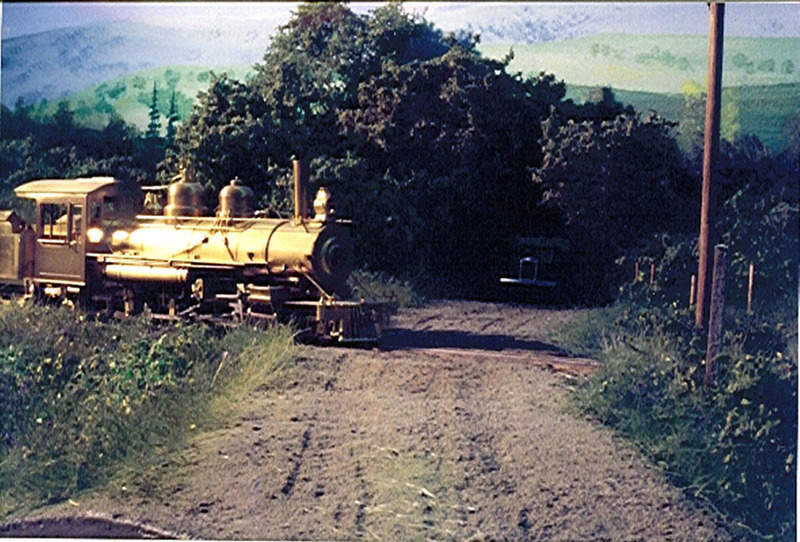 In 1971 I started Narrow Gauge Specialties to develop modelling products in On2 scale. 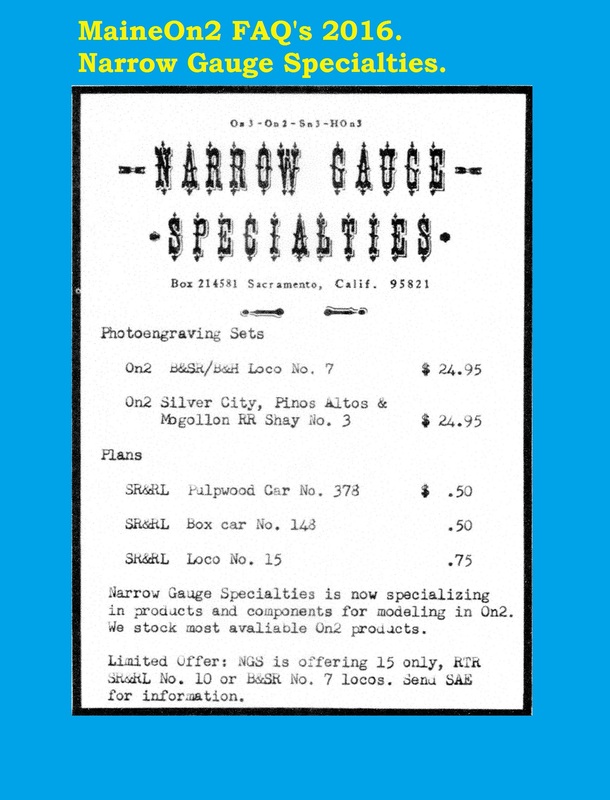 I released limited runs of kits, brass castings and photo etching sets of various two foot gauge prototypes. At that time there were no commercially available On2 locomotives so I set out to produce parts for B&SR #7/SR&RL #10. 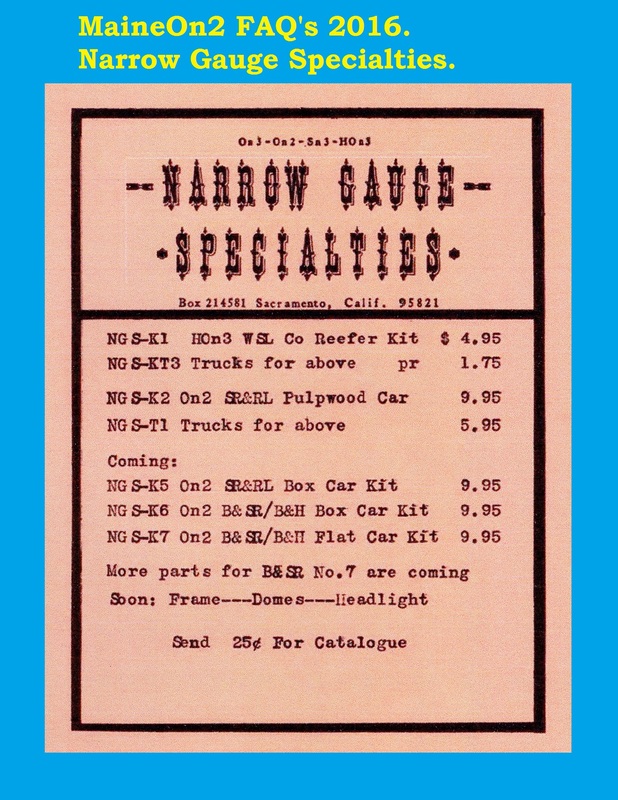 I released the etching set for B&SR #7 in August 1971. After that various castings and freight car kits were released. Although the B&SR #7/SR&RL #10 project was never completed, I have to acknowledge and thank Bill C. Brown for getting me started with it. He was an excellent On2 modeller and had produced patterns for the main frames, firebox brace/frame spacer, pilot beam and apron and other items for SR&RL #10 which I incorporated into my line of parts. All NGS items were manufactured by me and I still have the master patterns. I cut the wood and did the master patterns for the brass castings. The actual casting was done by Kemtron. The plastic parts were from Grandtline. Ric did sell some On2 etching sets under his own name. Those were exciting times when On2 modelling was just starting to happen. Ric did sell some On2 etching sets under his own name. Click here to view Ric’s Etchings on another page. Here is the first advert that we can find, from the May 1971 edition of Finelines magazine. Notice the wealth of lines carried. This advert comes from the July 1971 edition of Finelines magazine. This advert comes from the September 1971 edition of Finelines magazine. 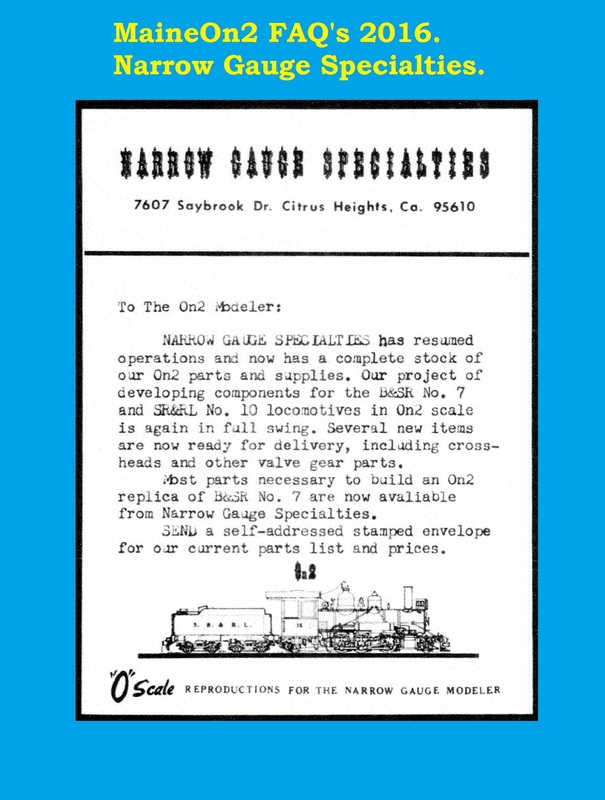 This editorial review of the Narrow Gauge Specialties products and offering comes from the November 1971 edition of Finelines magazine. Looks like Bob Brown was impressed by the quality of the merchandise. This advert comes from the January 1972 edition of Finelines magazine, and highlights the focus on On2. Notice the limited offer at the bottom, which suggests that NGS may have built a batch of RTR loco’s. 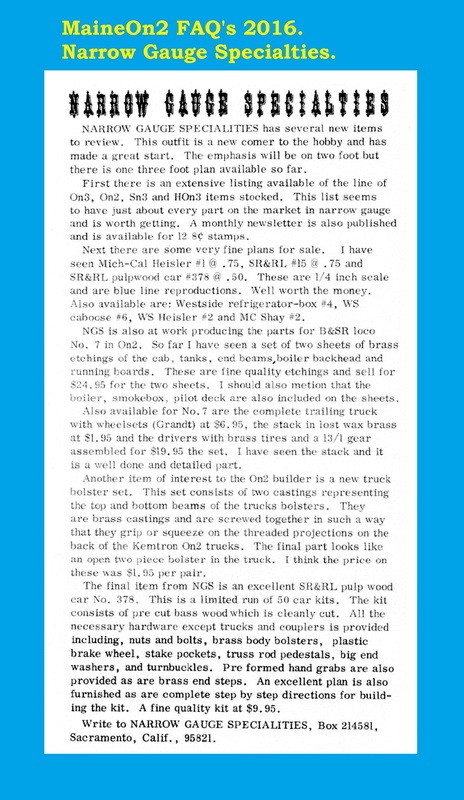 This editorial review of some of the Narrow Gauge Specialties B&SR #7 loco castings comes from the May 1974 edition of Finelines magazine. It looks like NGS took a break from advertising, relocated and brought out some more parts. 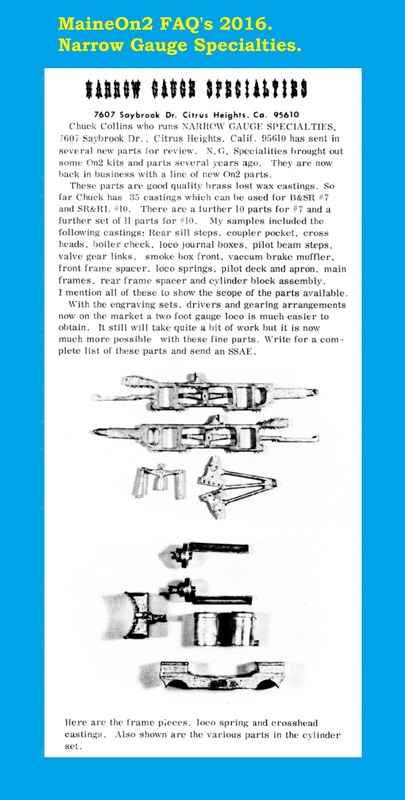 This advert appears in both the May 1974 and July 1974 editions of Finelines magazine. We can find no further adverts from NGS – did they continue in business without advertising in Finelines or the Gazette? All adverts from Finelines appear by kind permission of Bob Brown, Editor and Co-owner.